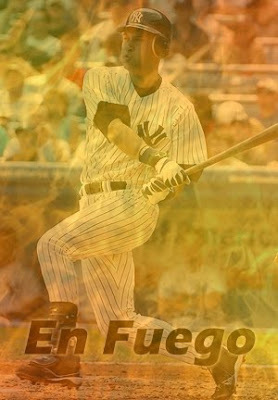 lenNY's Yankees - A Bronx Bombers Blog: Derek Jeter is hot, hot, hot! Derek Jeter is hot, hot, hot! One week after Robinson Cano was hot, hot, hot, Derek Jeter has somehow achieved the same degree of hotness or more. In the last seven days, Jeter even has more hits than king Joe Mauer (16 compared to 15). Jeter is hitless in just two games in August, while he has 10 multi-hit games in 18 total. So, is Jeter the best hitting shortstop of all time? Is he the MVP of the league, let alone the Yankees? Just wait. He still has at least a few more years in his career, and there is over a month left in the season. Both honors are up for grabs at this point.